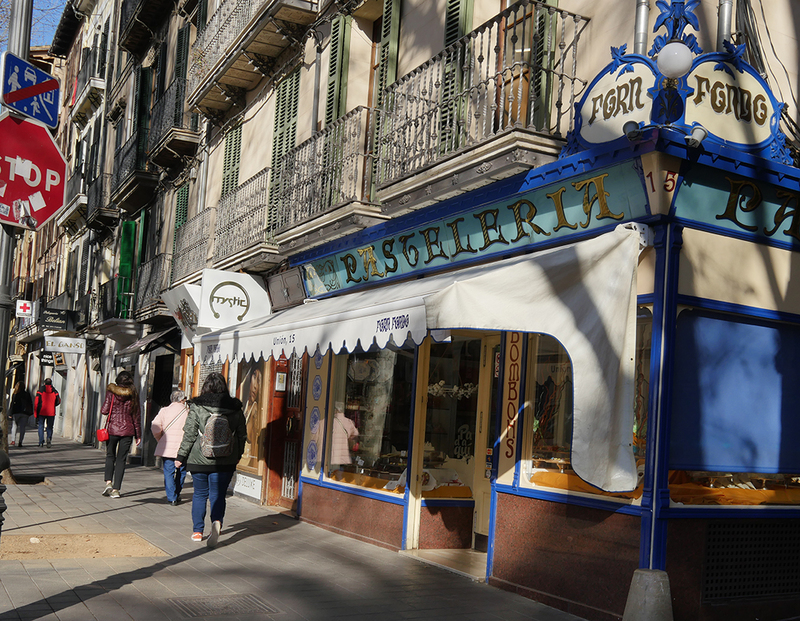 Emblematic Shops of Palma de Mallorca - Sun, Sand and Special Shops! 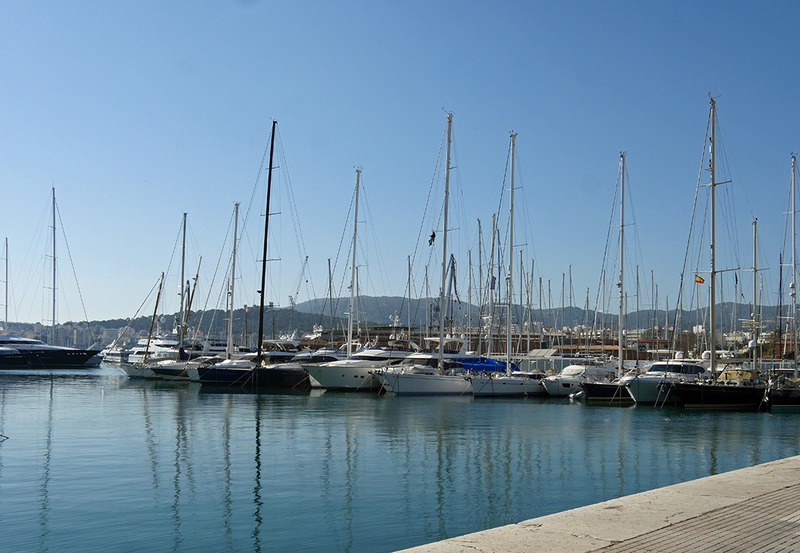 You are here: Home / Travel / Palma de Mallorca – Sun, Sand and Special Shops! 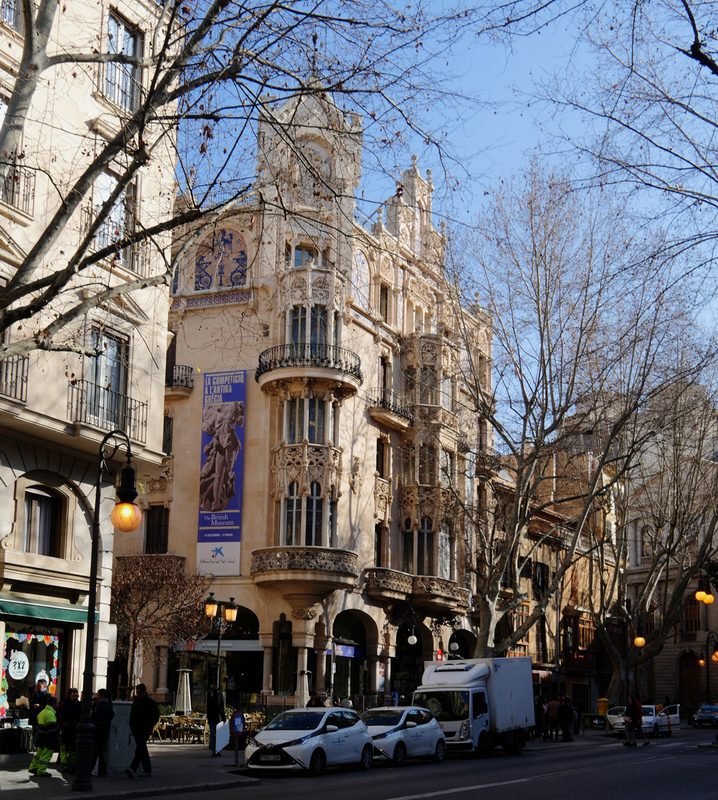 Palma de Mallorca – Sun, Sand and Special Shops! What comes to mind when you think of Mallorca? For me, it’s beaches, nightlife, bars and restaurants. A holiday vibe and a happy place with a great Marina. We can easily forget is that places like Palma existed before the Brits arrived and for that matter before the city was a holiday destination at all. 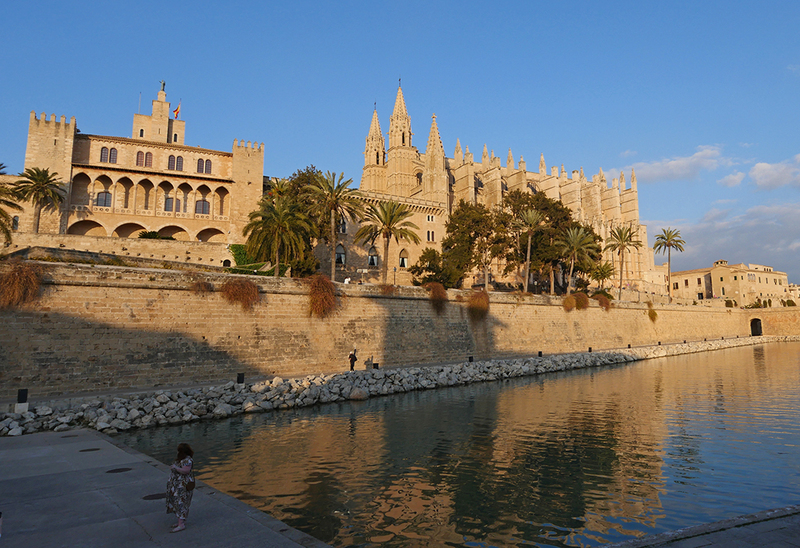 But, Palma was an important port for the Romans, who used it as part of a transportation route for olives and salt to Italy. And, it didn’t really come into its own as a holiday destination until the first hotel was built, El Gran Hotel, opening in 1903. The hotel still exists and is now a centre for exhibitions and events, with a rather beautiful cafe on the ground floor that’s perfect for people watching. The heritage of the old city and indeed of the island of Mallorca, with a wealth of artisan trades and crafts, shapes the essence of what we find today. Of course, if I went shopping in Palma I’d expect to find good representation from the key Spanish retailers like Zara. But, I’d look out for Majórica pearls or other imitation pearls produced by the method developed by German engineer Eduard Hugo Heusch, who started Manacor in Mallorca to manufacture artificial pearls of the highest quality. That said, I wouldn’t have been able to spot what was an authentic shop with a claim to a place in the history of Palma. 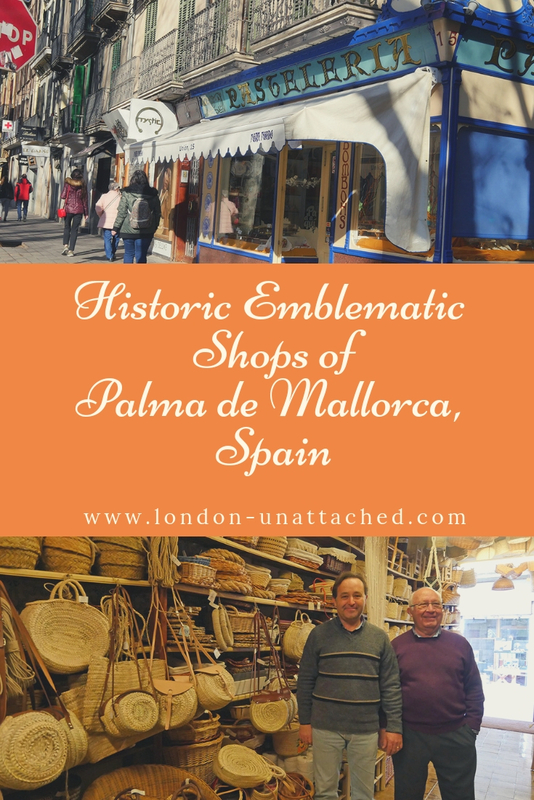 So, I love the idea that heritage shops are recognised in Palma and listed in a unique directory. 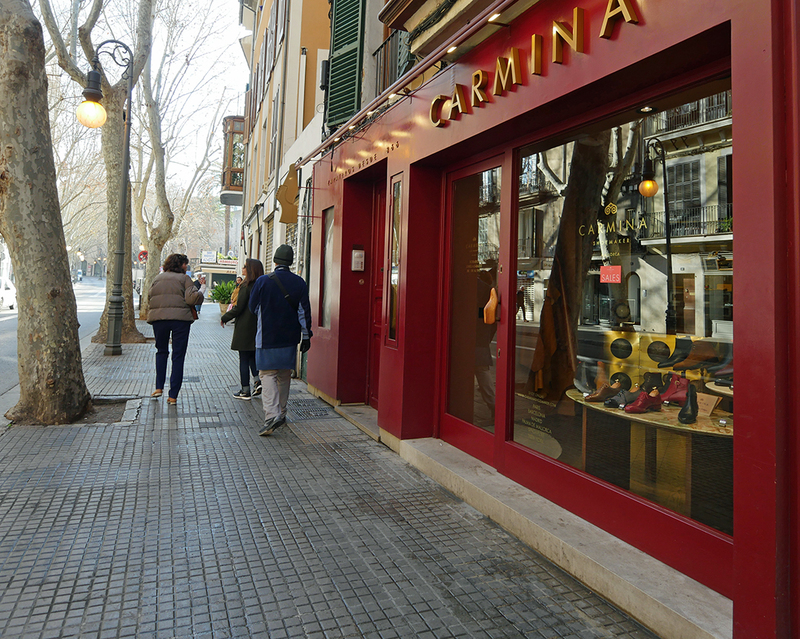 The emblematic shops of Palma range from traditional bakers through to glassware shops selling their own hand-blown glass, wickerware shops, toy shops and even handmade shoe shops. We went along to find out more about a few of them. To qualify as an emblematic shop, there are three criteria – each shop has to comply with at least one of the three. 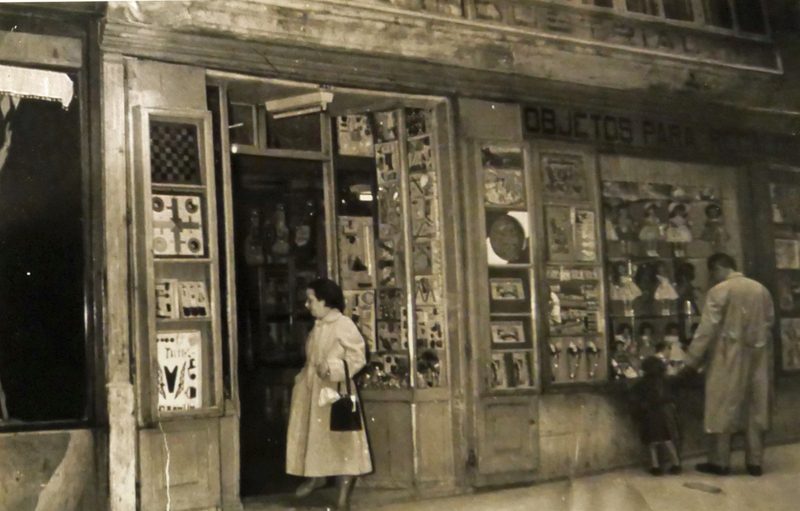 There are over 75 shops in Palma de Mallorca now registered as emblematic and there’s a fascinating online guide and map if you fancied doing a shop crawl. It can get tempting though – you’ll find things to buy that are unique and will always take you back to your visit to Palma. I defy anyone to visit one of the traditional bakeries like Forn Fondo and not eat. 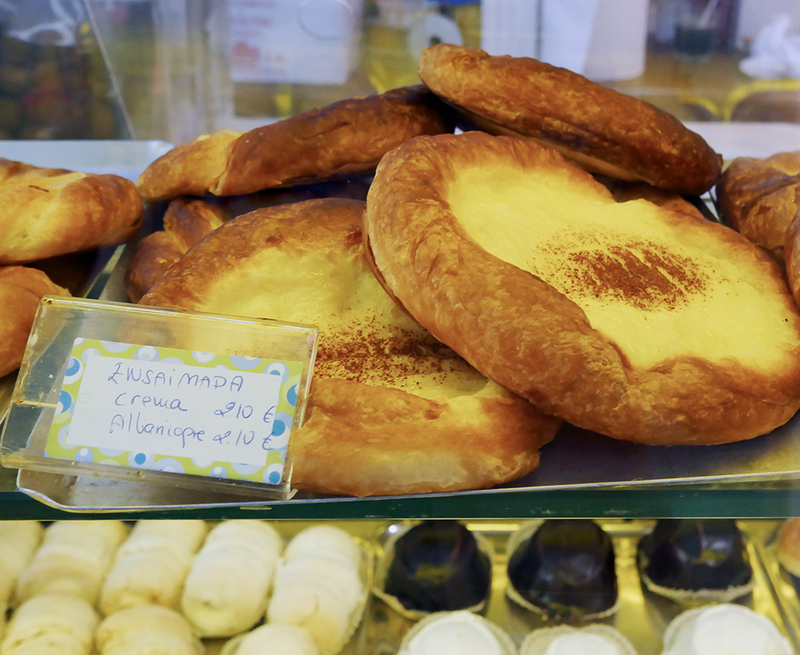 One of Palma’s best-loved bakeries, Forn Fondo has been in existence since 1742 and is particularly famous for its cream ensaimadas, though they make a whole range of savoury bakes too including cocas, coccarrois and empanadas. Mind you, I was really, really tempted by the marzipan Minions, perhaps not quite the most traditional purchase! 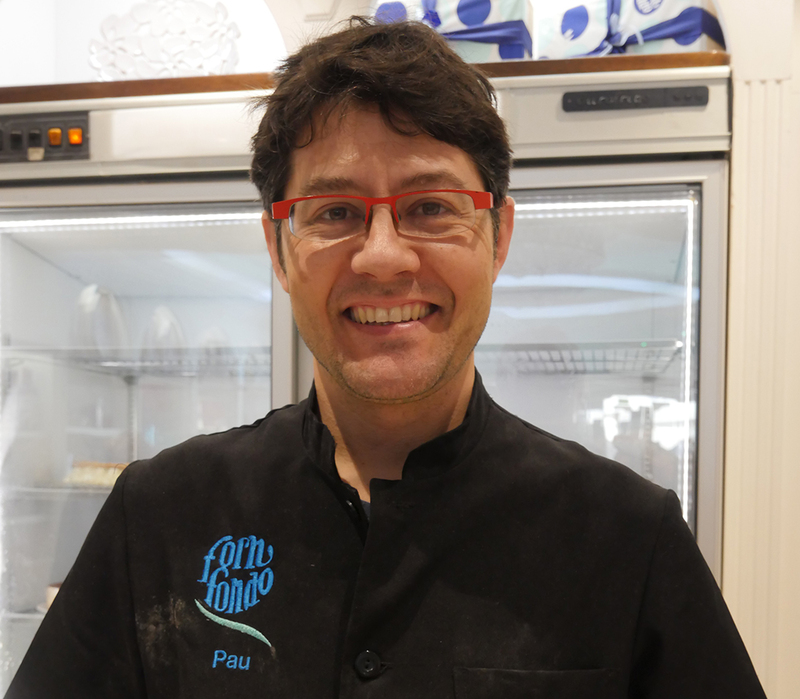 Pau, the current owner, has his family tree on display – showing three generations working in the shop. The shop window, lined with jewel-like glassware of Gordiola Glass offered yet more temptation. 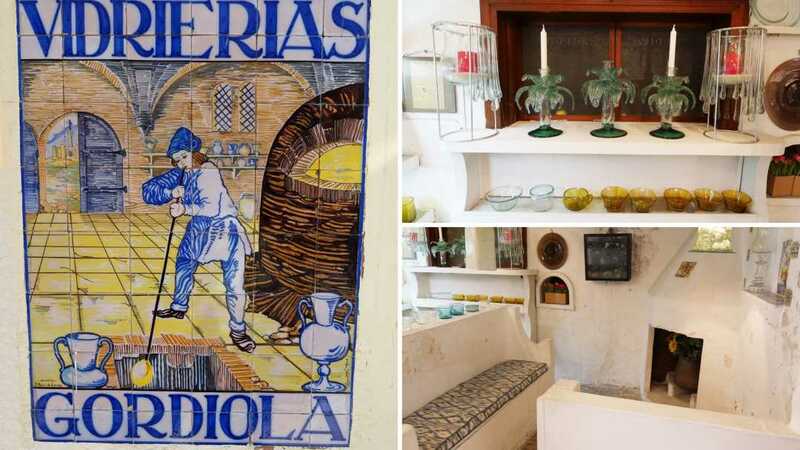 Celebrating their 300th year of glass making, Gordiola hand blows all their glassware in a factory around 20 minutes from Palma. The shop itself has been at that location since 1955. If you have time, you can visit the artisan factory in Algaida and see the glassblowers at work. 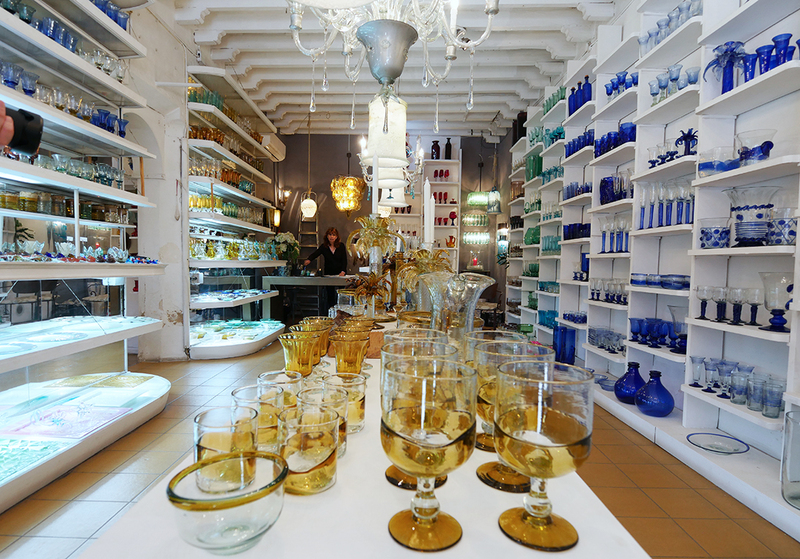 If not, the shop in Palma is a veritable cornucopia of glassware. It was so delicate and beautiful that I was nervous about the idea of travelling with it so didn’t buy anything. But I was very tempted indeed! Each piece is unique and the tiny bubbles just confirm the artisan nature of this hand-blown glass. You can buy everything from glass tulips, vases, glasses and plates to complex and beautiful chandeliers. The directory of Emblematic shops includes a number of leatherwork stores, including Carmina Shoe Store. The shop was closed when we first wandered past so I went back later to find out more. A fourth-generation shoemaker, Carmina makes shoes to order based on standard sizing. They specialise in shoes for both men and women made with a horsehide leather called Cordovan which is named after its origin in Córdoba, Spain and hand produce their shoes to order. The special leather makes the shoes particularly waterproof – and since you can customise the shoes to your own taste, your purchase will be totally unique to you. 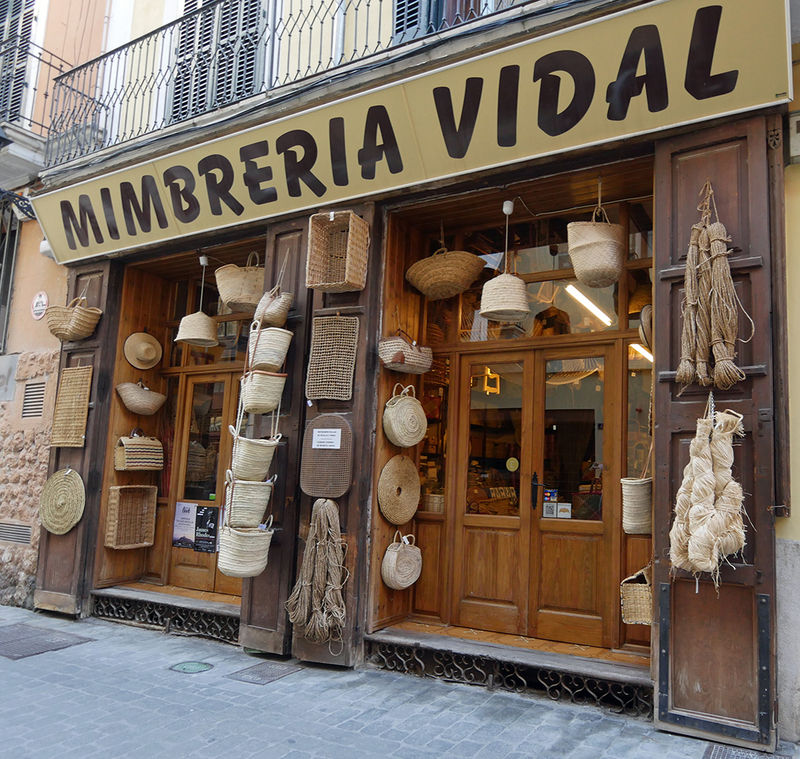 Or how about Mimbrería Vidal, a shop selling a wide range of traditional and contemporary wickerwork baskets, bags, hammocks, screens and more, all produced by hand. They’ve been producing since 1955 and the father and son team who run the shop clearly love their business. 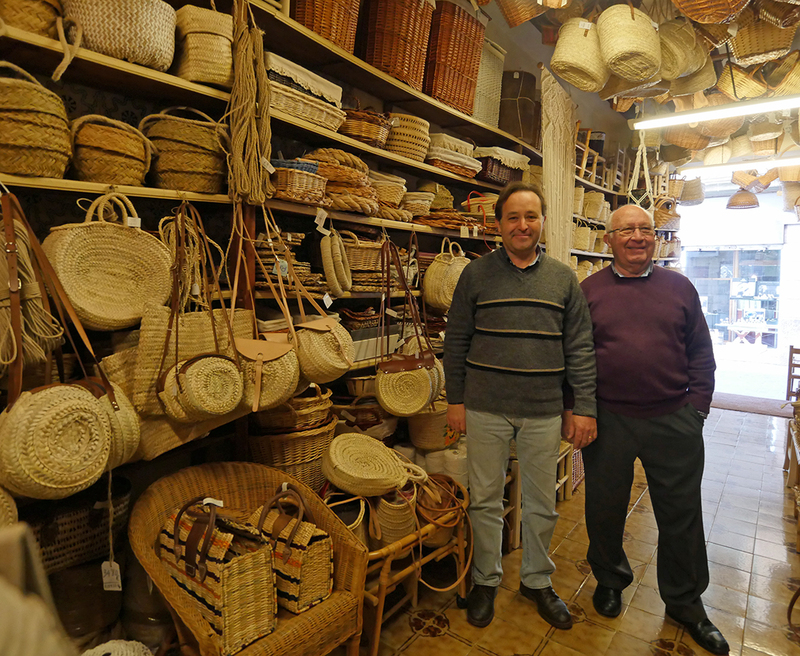 It is one of the last traditional wickerwork shops in Mallorca – and José and Tomas (second and third generation) proudly continue its tradition. Most of their products are made off-site, but still on the island. Given half a chance I’d have taken home a senalla or shoulder bag made from local Mediterranean fan palm leaves. All made on the island, these are perhaps the best kind of souvenirs – unique, local and traditional – oh and VERY useful! We were charmed by our visit to La Industrial, one of the oldest toy shops in Palma. The owner told us that her father had started the shop and that she’d grown up there. Sharing some of her old photos it was obvious how much this place meant to her. Amongst the toys, a large collection of Llorens dolls, all made in Spain. These traditional dolls date back to 1958 when Antonio Juan Juan started to make artisan dolls for special occasions like first communions. All manufactured in Onil, Alicante, the dolls manage to combine modern styling with a traditional look. There are, of course, plenty more emblematic shops in Palma. And, with a little more time I’d have loved to visit more of them. How about a 200-year-old traditional ice-cream parlour (Can Joan de S’Aigo Cafe) or a herbalist founded in 1890. Traditional Mallorcan textiles from La Filadora – founded in 1918, where you can buy the unique double-sided patterned linen and cotton woven textiles that are so much a symbol of the Balearic islands. 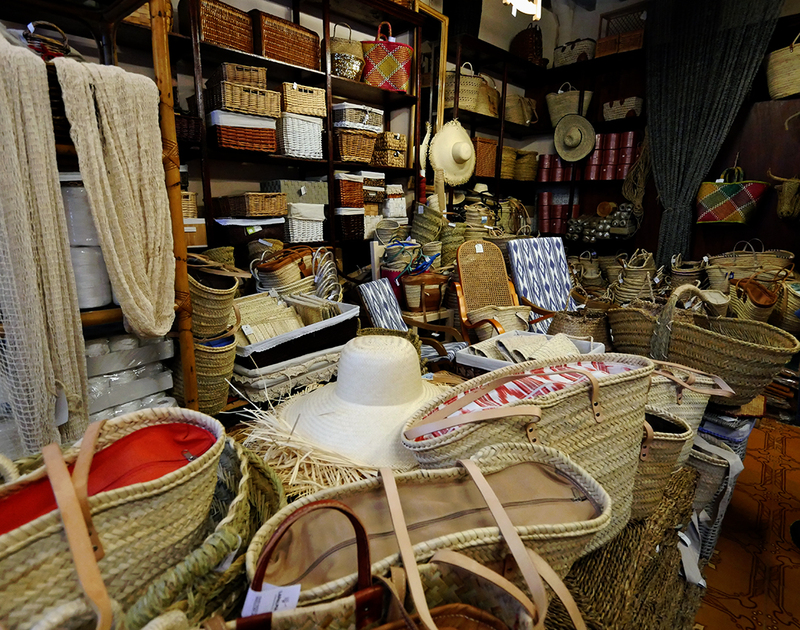 Or Sombrereria Casa Juliá, founded in 1898 where you can take your pick from a whole range of traditional hats! For me, it’s so much nicer to support these traditional, local artisan shops than to buy a fridge magnet made in China or a teeshirt from Taiwan. And of course, once you’ve shopped til you are ready to drop there’s are plenty of other things to see and do. I’d personally recommend taking a break down by the sea-facing Cathedral and Palace. There’s a little cafe there and it’s a lovely peaceful spot with a quite unique view. I stayed at the Brondo Architect Hotel Calle Can Brondo 207001, Palma de Mallorca, Balearic Islands Spain. Rates start at around £70 in low season rising to £250 in high season. Breakfast is 16 euros. I’ve written a feature so you can easily find out more about my stay at the Brondo Architect Hotel in Palma. I was a guest of Palma 365. For more information on Palma as a tourism destination please visit: www.visitpalma.com or follow the tourist board on social media on @passionforpalma.